In the vast scope of his musical expression, Prem Joshua, himself a Yatri (traveller) beyond musical traditions, creates an inspired collection of songs that reflect a deep love affair with India. People down the ages have heard a calling to sacred places within and without. In the East this journey is called Yatra (pilgrimage). If you feel this call — let this album be your travel companion. 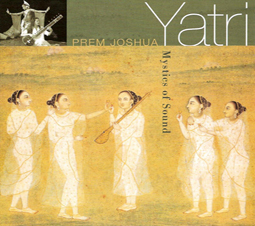 “Mystics of Sound”, also known as “Yatri”, is the new album out by World musician Prem Joshua. The first time I heard Prem Joshua in Los Angeles something changed in me. His music is the music you always want playing no matter where you are. Prem Joshua always blends his love for the East and his love for the West together in perfect harmony and does equally if not more so on this album. He told me that this album was developed on tour while in India and Europe and then finally came together in the studios in Europe. Rather then adhering to any rules, he and his band gave their best to each song and allowed the organic nature of each song to unfold and to ripen. The result is a mystical and groovy blend of vocals and instruments that takes the listener on a spiritual journey. To describe Prem Joshua’s music by a specific musical term is not easy as there are so many different facets to his sound. Call it World Fusion, East-West-Fusion, India Lounge, Indo-Ambient – all these names just give a vague idea of his actual music. But one rare definition applies to all of his CDs: it is “Music for Listening”. What a luxury in a time when most music has become a mere consumer’s item and lost all sacredness! Joshua’s music can accompany you through your daily affairs – but you might suddenly discover that you stop doing other things and start listening again for the sheer joy of listening – or even dance in your room. Who still provides music for that? And to me his music has yet another quality: timelessness. Even when listening to his older albums there is always a certain freshness to them. Working as a World Music Radio DJ I have been a fan of Joshua’s music for many years. I enjoyed his more acoustic and “classical” albums as much as his danceable liaisons with Trance, Ambient and Lounge. His new album “Yatri” features again more his acoustic side, the flavour of Indian instruments and Indian raga music. Rich melodies on sitar, flute and vocals fly over a background of smooth and groovy arrangements. Joshua’s sitar playing has ripened and matured even further. Outstanding on this album are also Joshua’s choir arrangements and the solos by Indian singer Sandhya Sanjana. Known from Joshua’s album “Shiva Moon” she is again featured here with her deep and rich voice. “Yatri” means traveller and is a tribute to India by a Westerner who got deeply involved with India’s musical tradition – but translates India’s musical essence in a very contemporary and cosmopolitan way.